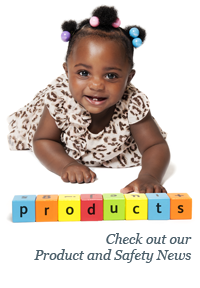 Safe Kids is committed to keeping you informed about recalls of products which can put kids at risk. This recall report includes 72,000 Waterpede bath toys which can break apart exposing small parts and 28,400 Nerf Battle Racer go-karts with steering wheels which can break during use, posing collision and laceration hazards. The Safe Kids’ recall center is a unique place where parents and caregivers can go to stay up-to-date on recalls of all child-related products. May 17, 2018 CPSC; Michaels recalls Creatology spin art kits and pottery wheels because the battery compartments in the spin art kit and pottery wheel can overheat, posing fire and burn hazards. Units: 373,000. May 10, 2018, CPSC; Munchkin recalls Waterpede bath toys, because the toys can break apart exposing small parts, posing a choking hazard to small children. Units: About 72,000. May 24, 2018 CPSC; IKEA recalls SLADDA bicycles because the bicycle belt can break, posing a fall hazard. Units: 4,900 (an additional 200 were sold in Canada). May 24, 2018 CPSC; Bluefin recalls wireless smart phone chargers because the charger can overheat while in use, posing a fire hazard. Units: 3,000. May 24, 2018 CPSC; Jané recalls Muum strollers because they violate the federal stroller and carriage standard. An infant can pass through the opening between the stroller armrest and the seat bottom and his/her neck can become entrapped by the armrest, posing entrapment and strangulation hazards. Units: 800. May 22, 2018 CPSC; Porsche recalls its My First Porsche toy wooden cars because the wheels and axles can detach from the wooden toy car, posing a choking hazard to young children. Units: 1,700 (an additional 330 were sold in Canada). May 17, 2018 CPSC; Discount School Supply recalls Colorations brand extra-large crayons because the red crayons may contain glass pieces, posing a laceration hazard. Units: 2,200. May 2, 2018 CPSC; Carter’s recalls 3-piece penguin cardigan sets because the cardigan’s toggle button can detach, posing a choking hazard to young children. Units: 107,200 (an additional 8,800 were sold in Canada. May 1, 2018 CPSC; Premier Kitchen Products recalls The Sharper Image and Frigidaire Mandoline slicers because the small blades in the julienne slicer attachment can separate from the plastic assembly, posing a laceration hazard. Units: 19,000 (an additional 230 were sold in Canada).